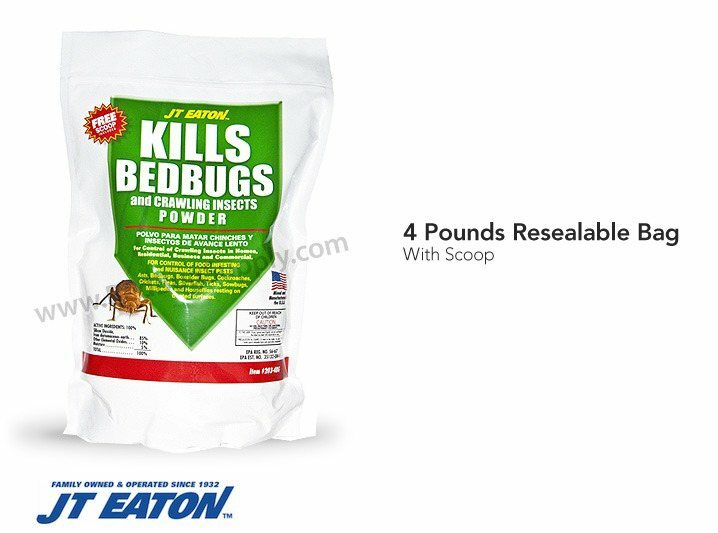 JT Eaton Kills Bed Bugs Powder is one of our best selling powders and offers great value, quality and is one of the longest killing bed bug products on the market. 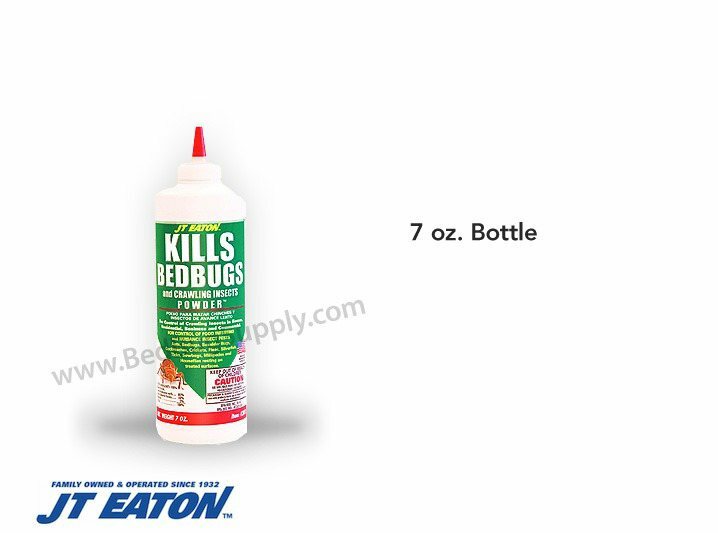 We suggest using our Professional Bed Bug Applicator to apply JT Eaton Bed Bug Powder, which helps to apply the powder with better control and into hard to reach areas. JT Eaton Powder should be applied after the room is steamed and J.T. Eaton Bed Bug Killer (pyrethrin killer), Bedlam Plus and JT Eaton's Bed Bug Killer II (deltamethrin) have been applied and are fully dry. Powder is designed to go into places where the sprays cannot including inside electrical outlets and deep cracks in wall voids, behind picture frames, below the edges of carpeting and rugs, etc. What we really like about the JT Eaton powder is as long as it's left undisturbed, it will continue to kill indefinitely and only needs to be applied just once during a ed bug treatment. 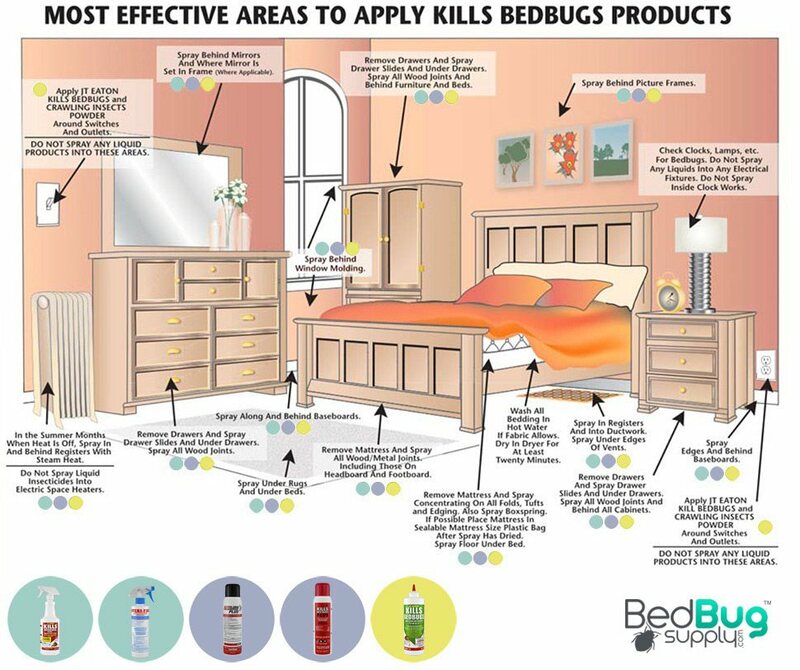 Please see the picture below illustrating where to use each of the J.T Eaton bed bug products. Before applying any of the JT. 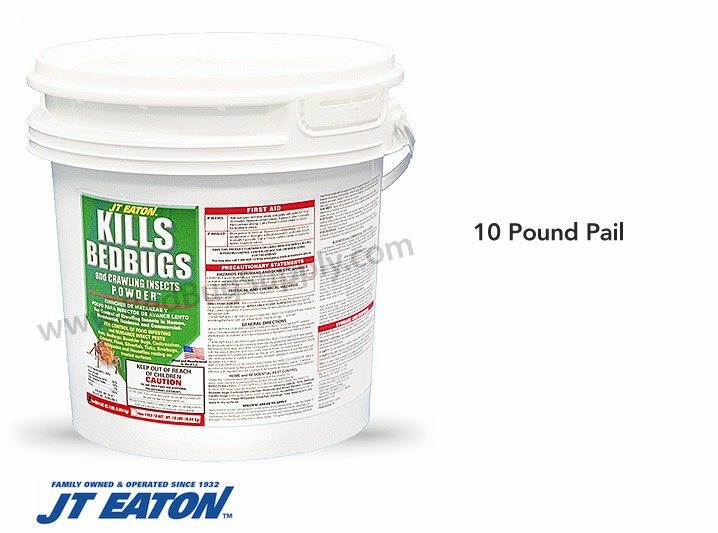 Eaton bed bug products, we recommend using our Professional Bed Bug Steamer on the edges of the room and inside cracks and crevices (allow to dry for one hour or until fully dry). 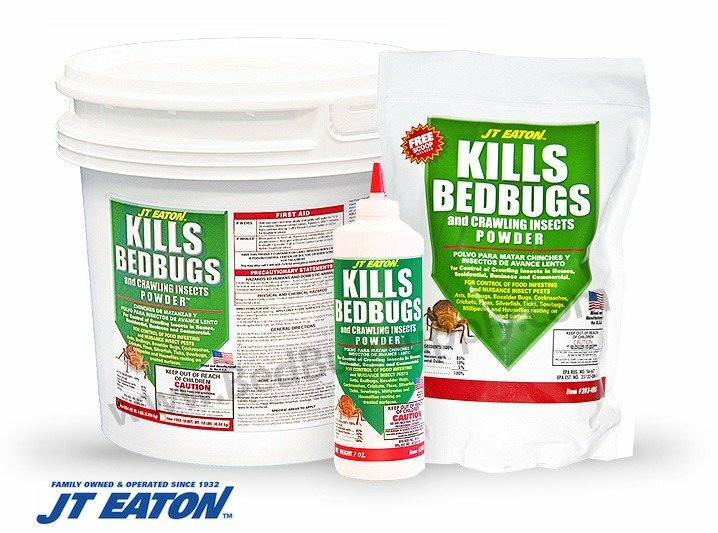 J.T Eaton Bed Bug Powder works by treating every deep hiding place bed bugs may attempt to seek refuge in (resulting in no place to hide without being killed). When a bed bug crawls into a treated crack or crevice they are instantly coated in powder, which adheres to their out membrane cutting them up and eventually leading to the bed bugs death due to dehydrations and asphyxiation. Bed bugs are made up of 65% water so it doesn't take a lot of powder to dehydrate and kill them. Bed bug powder can be abrasive to the skin and like any dust should applied carefully to reduce the amount stirred up in the air (a dust mask and eye protection are recommended for application). We offer a Professional Applicator, which offers better control when applying the powder and allows the user to gain access to hard to reach areas. Apply the bed bug powder directly into the cracks of baseboards, into crevices and inside walls by removing the electrical plates (do not powder into the electrical outlet). Apply powder only into cracks and crevices (places where bed bug hide) and not all over the place in large powder mounds. If applied properly, you shouldn't be able to visibly see the powder. Always follow the product's label for proper usage and precautions. Unless the powder is disturbed, wet or vacuumed up with a HEPA equipped vacuum, an additional application is not needed. Again, powder should also be applied after the room is steamed and the first application of JT Eaton Kills Bed Bugs Red Bottle Contact Killer and either our Phantom Aerosol, Bedlam Bed Bug Spray or JT Eaton Bed Bug Killer II (blue bottle) is applied. Bed bug powder should be kept dry and away from moisture to be effective. Always read and follow the instructions on the product's label to ensure proper and safe usage. Diatomaceous Earth is made up of ground fossilized material, which acts like tiny razor blades that cut open the outer layer of the bed bug causing them to dehydrate and asphyxiate. The powder can applied inside indoor cracks, around electrical outlets, inside walls, between carpet and the wall and around electronics. Unlike other diatomaceous earth powders, JT Eaton is labeled for use against bed bugs ensuring effectiveness. • Inside electrical outlets (by remove the outlet faceplates and dusting all 4 corners of the inside cavity - be sure power is off and do not powder where the plug goes). • Inside deep cracks of furniture (if a credit card can fit in the crack a bed bug can too! • Please see the illustration of the bedroom below for a more detailed list of places to apply. Q: doe the powder ommit an odor is it safe for pets and kids with allergies? The powder doesn't emit an odor that any of us at Bed Bug Supply can detect. It is safe for pets and children with allergies; however, it shouldn't be applied anywhere that people or pets can come in contact with it. Powder should be applied only in deep cracks, crevices, and joints, where the powder is not visible from the surface after it's been applied. Scattering the powder in open spaces is not recommended. Q: How long do it take to kill? Diatomaceous earth does not have a set range of kill time. The time to kill varies depending on where the powder is, the manner in which it was applied, and how the bed bug crawled through it. All of this affects how much powder gets on the bug. Fortunately, the powder works indefinitely as long as it stays dry. Q: can I put it on my dog? Please do not apply any form of insecticide on your dog. Nothing that kills bed bugs is safe for use on humans or pets. Also, it's highly unlikely that bed bugs are on your pet to begin with; if you believe a bug is on your dog, it's more likely a flea or tick. Q: I have a three story 2 bdrm townhouse but I believe I only have bedbugs on the third floor. How much de do I need to get? You likely won't need more than one small bottle of diatomaceous earth, as it's not intended to cover the entire area that you're treating. Powder should only be applied in deep cracks and crevices throughout the room, like along baseboards, floorboards, and the edges of the carpet. When done properly, you shouldn't see the powder at all after you're done applying it. For this reason, you won't need a lot of powder to include it in your treatment process. Q: Is this food grade? This product is not considered food grade, as there is no need to put it through the purification process for its intended purpose. Q: 1.- how long dose it take to kill them? 2.- is it safe for human contact? Once the bed bugs come in contact with the diatomaceous earth, they typically die of dehydration within one to two days. This will vary depending on where and how the powder was applied, and how much powder stuck to the bug's waxy shell. Diatomaceous earth is generally safe for human contact. However, when applied correctly, human contact won't happen. Diatomaceous earth should only be applied in deep cracks and crevices in the room, such as along baseboards, floorboards, and the edge of the carpet. Q: Is this product harmful to cats? Diatomaceous earth is generally considered safe for mammals, including cats. However, make sure that you don't apply it in open areas, as that's not how it is intended to be used against bed bugs. Diatomaceous earth should only be applied in deep cracks and crevices in the room, like along baseboards, floorboards, and the edges of the carpet. When applied correctly, your cat won't be able to reach the powder to come in contact with it. Q: Do you sprinkle the powder on the matterss? We advise not putting powder on the mattress as you may possibly inhale the powder. Instead, simply encase the mattress with a SafeRest encasement, treat the frame and apply ClimbUp Insect interceptors. Also be sure to move the bed away from the wall and remove any non-essential pillows and bed skirts. 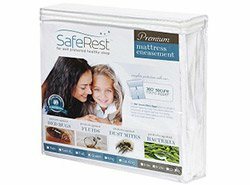 Q: Can it be used on a mattress or inside a mattress cover? While the product is labeled for use on mattresses, we still feel that a contact and residual spray combination (like STERIFAB and Bedlam Plus) would be a much more effective way to treat a mattress. Once a mattress cover is installed, there is no need to treat the mattress any further. Q: Is it safe to use on the vents and my whole house is wood floors do I use all over the floors as well and move out for a couple days and then mop and reapply in around baseboards and outlets? What you're describing is not a recommended treatment process, and is not the method of use that is described on the product label. To ensure safe and effective treatment, never use any EPA registered product in a way that is not described on the label. For a method more proven effective than what you're describing, see our 4-step solution. I had to move from my house because of the bed bug problem. I then moved my stuff in storage 9 month later thinking the dam bug was dead I moves the old bed bug stuff to the new apt was my mistake.I found that out the hard way when I woke up in my new apt inching like crazy and I knew what it was there back :( ! !Think god for this product because I rather sleep in my car then go another sleepless night inching like crazy. We tried almost everything to get rid of bed bugs. This one finally worked, we used this powder with the spray under the mattresses, beds, other furniture and corners of our apartment, now we are free of bed bugs. yay! Reviewed by: Chandu from omaha. Reviewed by: Rick D. from VA. The powder is very effective in treating bed buy infected areas and is easy to use. It is a must for any bed bug fighting tool kit. Reviewed by: Miss D. from Los Angeles Area. We used the powder in the walls, faceplates and places where we though bed bugs might be hiding. We put the powder down 3 days after the sprays as instructed and worked. We are now bed bug free. I would suggest following the steps carefully. Reviewed by: Heather from MARSHALLTOWN, IA. Reviewed by: Sloan from MD. 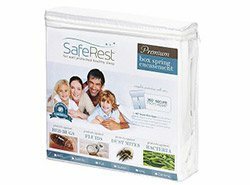 used this product in conjunction with washing and encasing and getting rid of stuffed animals and mattresses and I've been free of the bug problems for several months. Highly recommend to any one with problem. Reviewed by: Lisa from Tampa FL. I us the power and for the most part it worked good. When you have these bugs there is no quick fix. I work for two months trying to get rid of the bugs. What I have to do was finely move everything out of the room. Inspect everything. You will not beleive were I found the bugs. After everything is out dust everywhere. BE 100% SURE THERE IS NO BUGS IN THE ITEMS YOU BRING BACK INTO THE ROOM OR YOU JUST WASTED YOUR TIME! Reviewed by: Mark from Lawrenceburg IN. Reviewed by: megan from pennsylvania. I highly recommend JT Eaton for getting rid of bedbugs...effective and inexpensive!!!! Reviewed by: Donna W from St. Louis.